Twenty-seven faculty, residents and staff from the UW Department of Family Medicine and Community Health’s (DFMCH) Madison residency program and Baraboo Rural Training Track began a deeper exploration of how identity, privilege and marginalization can impact learning during a core faculty retreat on September 14, 2018, at the Fluno Center. Above, DFMCH teaching faculty Jensena Carlson, MD, and Sarina Schrager, MD, during a break at the core faculty retreat on September 14. 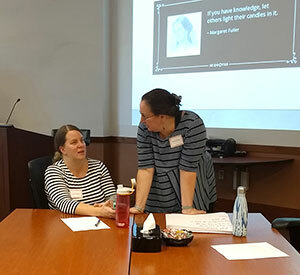 They participated in an adapted version of a workshop, “Teaching Inclusively,” co-facilitated by Don Gillian-Daniel, PhD, from the UW-Madison Collaborative for Advancing Learning and Teaching, and Anne Stahr, MS, from the UW School of Medicine and Public Health (SMPH) Office of Faculty Affairs and Development. Participants began by examining components of their own professional identities. They mapped factors such as medical specialty, academic rank, class, national origin, sexual orientation and physical characteristics in a pie chart, with larger slices representing the aspects that stand out most to them. At the same time, they discussed which of those factors were culturally more dominant or subordinate, raising awareness among those who represent the majority, and affirming those who are minoritized. Learner-content interactions, such as using diverse examples to illustrate concepts. They then partnered up and acted out a hypothetical instructor-learner scenario in which a white resident makes assumptions about the causes of a black patient’s diabetes, while also mispronouncing the patient’s name. Participants had to verbally respond to the microaggressions in real time. After the experience, they debriefed in table groups to problem solve and offer suggestions for improvement. Madison residency program associate director Thomas Hahn, MD, says that the concepts covered in the workshop have been a leading topic at recent national family medicine education meetings. While considering ways to create a similar educational experience for DFMCH faculty and residents, he and several colleagues participated in “Teaching Inclusively” through the SMPH’s longitudinal teacher/coach program. Responses to the workshop were positive, with one participant calling it “outstanding,” and others expressing interest in follow-up sessions. For now, the DFMCH will offer the workshop to all Madison and Baraboo residents on October 25 and 26. Dr. Hahn hopes to offer more learner-focused sessions in the future, and also partner on new ones on responding to microaggressions in patient-care settings. To learn more about the workshop at the DFMCH, contact Dr. Hahn at thomas.hahn@fammed.wisc.edu. At the SMPH, the workshop was part of this year’s Medical Education Day and is offered through two-part sessions on October 9 and 23. Some of its content is also being woven into the ForWard curriculum for medical students. To learn more about future offerings at the SMPH, contact Anne Stahr at stahr2@wisc.edu.